Visit our Student Membership FAQ page to search for answers to our most frequently asked questions. If your school had a chapter of the National Junior Honor Society (NJHS) when you were younger, you knew that an invitation to membership was the pinnacle of prestige and honor. Membership in National Junior Honor Society (NJHS) may be an ideal opportunity for those students who are ambitious and particularly high achievers. How Can Your Student Become an NJHS Member? First, you will need to learn if your child’s school has an NJHS chapter. If so, check with the school’s main office or website to identify the chapter adviser. 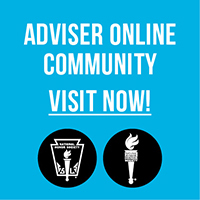 The adviser is a faculty member who will be able to tell you the cumulative GPA required for consideration and a timeline when students who meet this benchmark will be invited to submit information to be considered for membership. 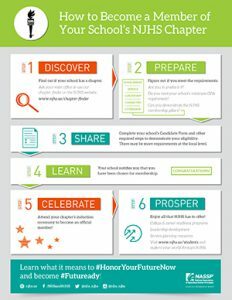 » Here is a visual guide prepared by the National Junior Honor Society about how to become an NJHS member. Students in grades 6–9 who meet the requirements for membership outlined by their school’s chapter are eligible to be invited for membership.